We are sorry but Jarred is not due to perform for a while. 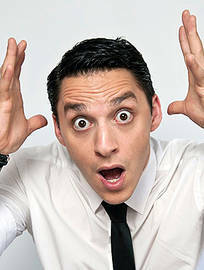 Jarred has been on the NZ Comedy scene professionally since 2009, and has performed sold out shows in six NZ International Comedy Festival seasons. He has performed for a number of celebrities including Jack Black, Dan Aykroyd and Paul Daniels. Along with headlining shows around New Zealand, Jarred has performed in Singapore, Kuala Lumpur, Kota Kinabalu, Brisbane and many more.